Commissioned painting of a Peacock during the Monsoon season, elegantly dancing in the rain. Colored inks, liquid gold paint, black Indian ink, black pen and acrylics on paper. This wise Owl illustrates their large eyes and their success in hunting at night. Black ink pen on paper. A small delicate drawing of a Robin filled with intricate henna patterns. Black and coloured ink pens on paper. A symbolic Kingfisher drawing showing prosperity and love. Watercolor pencils with black ink pen on recycled cotton rag paper. 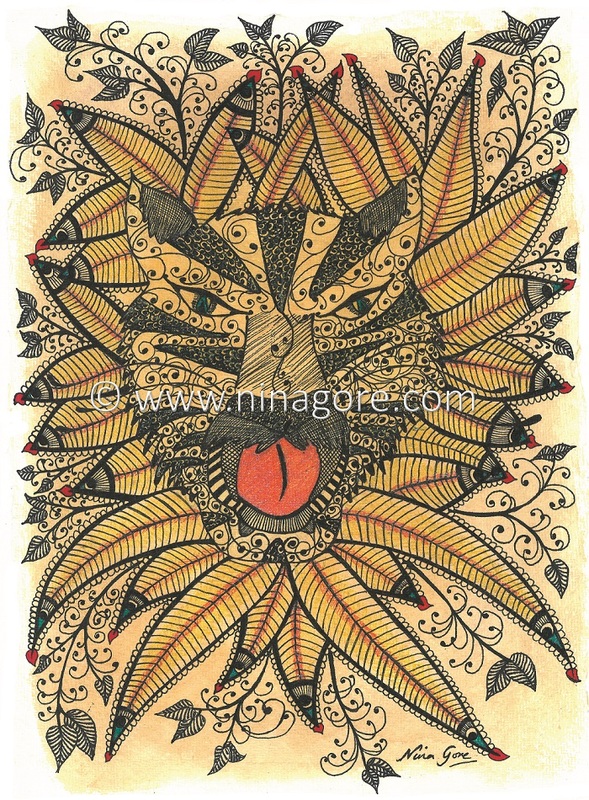 A powerful Tiger design representing their majestic strength and beauty. Ink pens on recycled cotton rag paper. A powerful design representing the Eagle as a beautiful yet strong figure. Black ink on canvas paper. An Elephant silhouette filled with intricate henna patterns. Black ink pen and acrylic paints on recycled cotton rag paper, stained with tea. 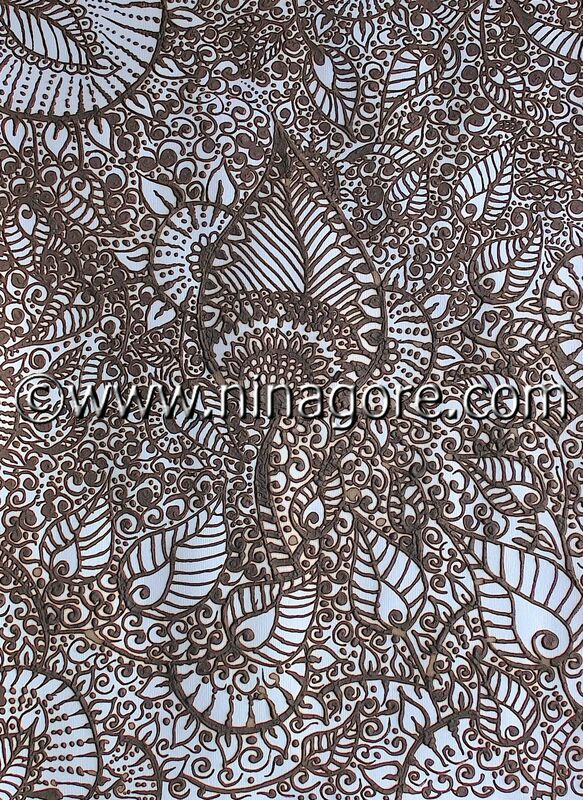 Henna on canvas paper. Resembling flower buds before they blossom. ‘Beyond the Horizon’ was created on canvas with cream and light purple acrylic paints for background colour and overlaid with a design done in henna. This piece has been sold. 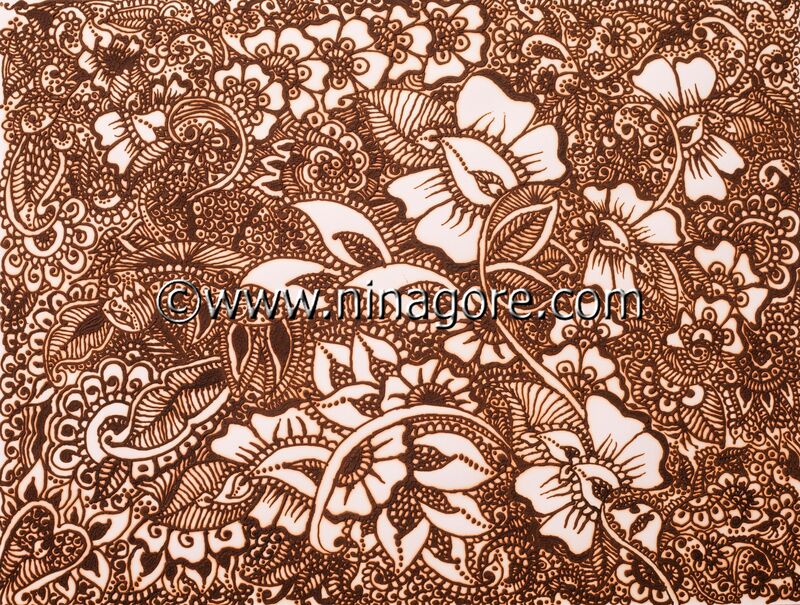 Henna on canvas. Representing flower petals that have fallen onto the ground. 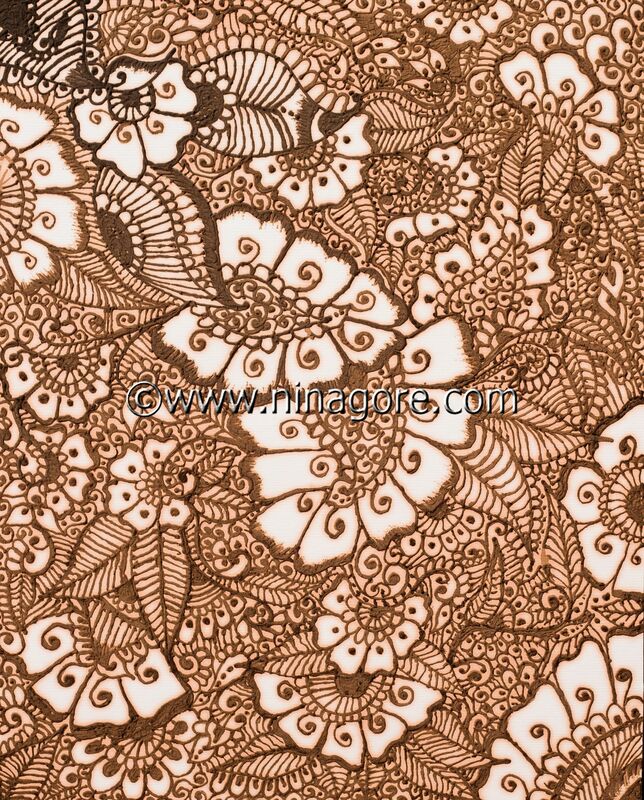 Henna coloured pen draw onto canvas paper. The middle panel and all 3 panels together of ‘A Vibrant Peacock’. On canvas with light pink and green oil pastels blended for background colour. I created the peacock design with henna paste using a cone and used acrylic paints for the vibrant effect. My inspiration was my Indian culture. ‘A Vibrant Peacock’ – created on a 3 panel canvas with henna, oil pastels and acrylic paints. My inspiration here was India and I remember the wonderful bright colours at bustling markets. This art is created on canvas paper and the faded colour of the henna reminds me of the old photographs my parents had when they first met years ago in India. The old photos were small and faded, they held wonderful and precious memories of their past. ‘Transparent’ was created on glass with permanent black maker. My first ‘Peacock’ henna design using bindis for decoration. This was created on a small canvas, the design is simple but effective. 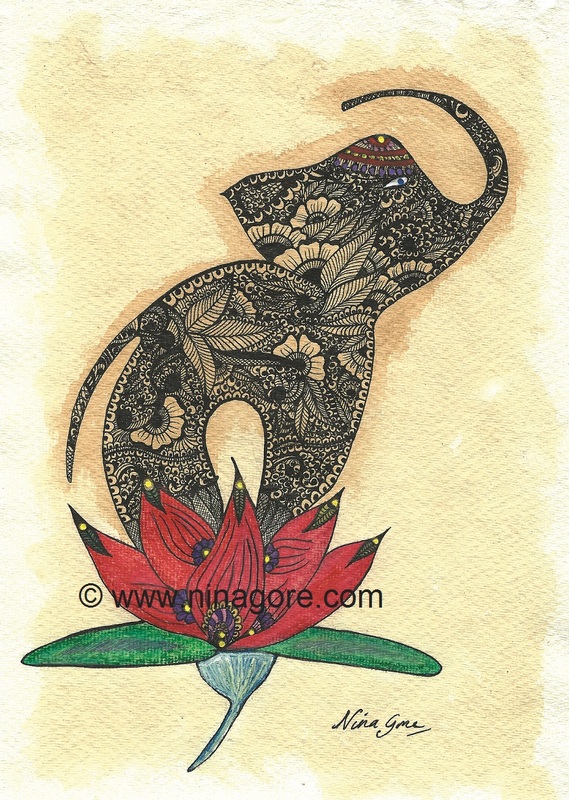 This piece was created on white canvas paper, starting with bold and elaborate strokes applied with a henna cone. The pattern centralised around a few large floral designs with surrounding elegant lines and swirls, to give a sense of luxury. The colour from the henna stain was a deep brown, earthy and beautiful, which led me to name this particular artwork ‘Fall’. Before I started to apply the henna to the canvas I first created a delicate creamy background using oil pastels. I then created small free-form floral designs in one corner of the canvas and developed the rest of it from there over time. This piece is very detailed with the use of intricate patterns across the canvas. I have named it ‘Joyful’ because of the happy reaction I get from the people who have looked at it! 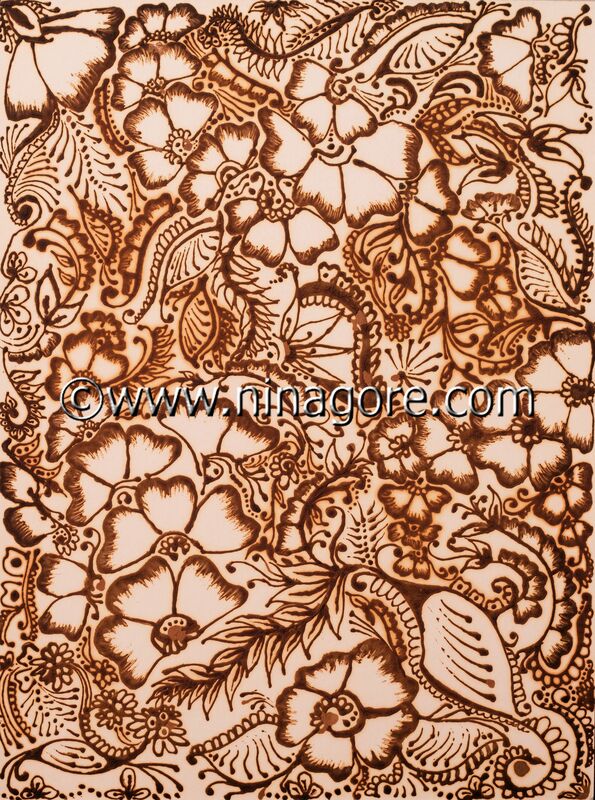 ‘The Beginning’ was the first piece of Henna Artwork that I created on card. It started off with a doodle and then it just went from there. In fact, this is a common theme to all my work, I usually start with a small pattern and develop it from there, purely through imagination and improvisation. This particular piece contains more visible white space compared to some of my other designs which allows the tiny strokes and smudges, naturally created from the henna, to be more noticeable.